"In those days it never entered my mind that I might direct. said, 'Why not? All right, go off and do something.'" "Go off and do something..." That's a T Shirt, right there. Crichton went on to become one of the British Film Industry's most celebrated directors during the 40s and 50s with a real flair for comedy. John Cleese invited him to helm A Fish Called Wanda on which he did a terrific job at the grand old age of 78 after a break of 23 years. He kept his hand in with some TV stints but Crichton's signature work though was at Ealing Studios. 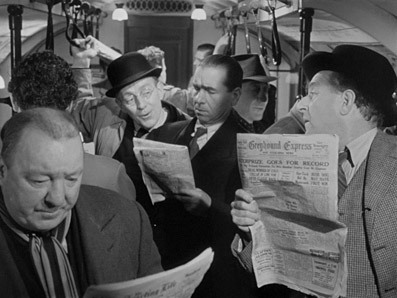 And arguably best known from those classics is The Lavender Hill Mob, reviewed on DVD as part of a Sid James Collection that you can read here. In our dual coverage of Went The Day Well? I was able to find angles that were mentioned in the DVD review into which I could delve a little deeper. But Slarek's covered all the bases on Lavender and I'm of exactly the same view on this charming little movie set in a fantasy England, one which those of a certain age all recognise. There are one or two snippets to share before I get to the meat and potatoes of Blu-ray quality and the Extras. First off, why did so many films of this period not employ some sort of drop shadow to their titles, half of which are swallowed up by any light background? Now, it's a mouse click and then it was a relatively fiddly, expensive and complex optical process but still. Secondly, my comedy heroes were Laurel and Hardy when I was young, a loving and well-judged inheritance from both enthusiastic grandfathers. I even got dispensation from a fellow fan that was also my boss at the time. He let me leave work early so I could race home and record them on VHS. The definitive non-Laurel and Hardy fan of my childhood was my mother. I didn't understand her reluctance to embrace the pair's buffoonery in my early days but once she applied the same criteria to Basil Fawlty, I started to understand where she was coming from. She had this idea (a good one but hardly realistic) that no one could be that stupid (!) and therefore fodder for one comedy scrape after another. I begged to differ but she had a point. When a rather obvious dummy of Oliver Hardy careered down the steps attached to a piano in their finest half hour, The Music Box, my mother was annoyed and frustrated at the pair's idiocy. In contrast, I had tears in my eyes. Oh, and while we're in 30's Los Angeles with our two removal men, check out the sound effect of the ladder hitting Oliver Hardy in the eye – one of the two greatest comedy sound effects of all time. Incidentally the second (IMHO) is Taggart's (Slim Pickens) cosh strike on to the head of Burton Gilliam as Lyle delivered in the middle of the words "Horses?" and "We can't afford to lose no horses..." It's just one of those sounds that is so perfect. Back to the boys struggling with the piano... The fact that once at the top with the heavy box, the pair started to climb down again having been told there was an easy road up the hill had her apoplectic with frustration. 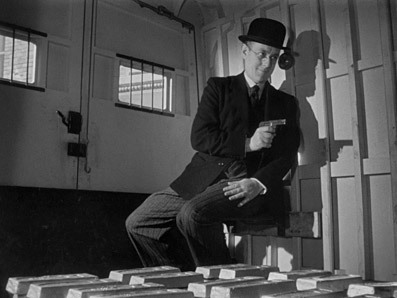 I experienced the tiniest portion of this in one of the most excruciatingly frustrating but still funny moments in Lavender Hill Mob. Our heroes are trying to catch up to a school party, quite a few of whom have bought a solid gold Eiffel Tower by mistake. They are about to disembark and in order to follow them on to the ferry, our boys have to pass through several stages of red tape. There's always one more and I just imagined my mother sitting on the settee saying "Oh, for God's sake!" as each obstacle was placed in front of our heroes. I have to admit, after the fourth time they are recalled, I was already to scream myself. And of course, they miss the ferry! 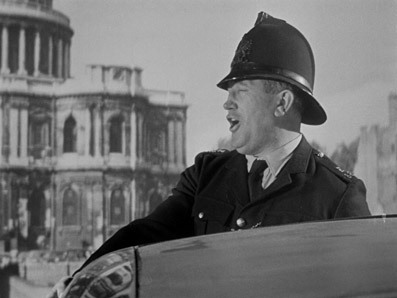 Stanley Holloway's protestations are almost enough to forgive the exquisite torture of comedy by obstacle accumulation. Presented on the Blu-ray in the aspect ratio of 1.33:1, the digital restoration looks pretty damn fine. In a comparison with DVD frame grabs, there seems to be slightly more picture information in frame on the right and less at the top of frame suggesting a hard or soft matte addition from negative to Blu-ray. The blacks are rich, the whites are generally consistent but still a little high in some areas and the scratches and dirt that are present do not distract at all from the viewing pleasure. The grain is often noticeable but again, at an optimum distance, it doesn't bother at all. The mono soundtrack is clear from noticeable hiss and age related pops and there are subtitles for the hard of hearing. Following in the tradition that it takes one particular American champion of great British cinema to lend some weight to the appreciation of our past classics, here's cinephile Scorsese to ease us in to the movie. It's obviously a favourite of his although his pronunciation of the word 'bullion' makes you sit up and go "Huh?" The man asking the questions, Sidney Cole (on the 15th December 1988) is recorded much clearer than his subject, the great (and admirable) Crichton. There's a lot of low end rumble which make Crichton's speech difficult to hear properly. But given this, there are a few gems – during wartime just before he started at Ealing... "See that plume of smoke in the distance? That's the studio." I was heartened to realise that he started in the cutting room and was given three weeks doing absolutely nothing to prove his worth. In fact the director of Went The Day Well? Cavalcanti, employed Crichton as an editor. Illustrating the audio only interview is a still, presumably from the behind the scenes of The Lavender Hill Mob but Crichton himself is so far away that even if the image was HD, he's still difficult to discern. Another fascinating revelation was that director Alexander Mackendrick often made co-workers do the opposite to what they had intended to do in order to have them clarify their own thinking. I must try that. This is undated but research puts its transmission in about 1972. A Thames TV Presentation, this is an excerpt from a gloriously naff looking TV show with examples of clothing you have to turn ninety degrees to the right of reality to accept that people actually wore. The fashion seems right for the year but then Clark is wearing one of those suits that in broadcast standard definition turns a dour striped suit into a multi-coloured affair. Nicknamed Tibby, Clark tells us of his Oscar success, how scripts are written and the bravery of Ealing producer Michael Balcon in taking chances on untested talent. Nicholson, (and one presumes the rest of the world in 1972) seems amazingly naïve. She actually asks if "there is dialogue in the script?" Film was such a closed and secret industry in the 'old days'. I suppose a screenplay would look like a coded transcript. But as a look behind the scenes on Lavender, this is priceless. The original negative is shown to be wildly far up the light end of the contrast ratio. It's dirty with both sparkle and scratches. The blacks are milky grey. The restored version corrects the blacks but still some whites burn out a little. A lot of the worst offenders have been removed but this is no blemish free restoration by any means but it's more than enough to keep me happy. 13 stills, some of them publicity shots, worth a scroll through. At last, a trailer from its time but one with a much more modern sensibility. It's almost sublimely Pythonesque. It comes to an abrupt end but there's a great deal to enjoy in the two and half minutes. It proclaims that we've all heard of the bad men, Dillinger, Dalton, Jesse James... but there are others who (and I quote) "blast other bad men off the screen..." Of course, the images of the refined Guinness and Holloway are cut for laughs and it works really well. The other line that had me chuckling was that these men were "...born to violence." Marvellous! A much loved classic from an era when film-makers could take chances in the mainstream and still forge a career even if the movie didn't make its money back on its first weekend. The acting is charismatic, the quality of the direction and editing top notch and the humour works well even 60 years on. Highly recommended.